I remember reading how the Obama Administration had ok’ed the use of a cruise missile in Yemen last December 17. What I didn’t know is that, according to an Amnesty International Report released a few days ago. this particular cruise missile delivered anti-personnel cluster bombs to its target. The Obama Administration claimed that the missile attack targeted and killed Al Qaeda (or Al Qaeda – like) operatives in Yemen’s Abyan Province. if Amnesty’s claim is true, wouldn’t this bombing, given the civilian casualties be considered a war crime? Are we reaching to the point where our government considers anyone, including women and children, potential terrorists because of where they reside, as the Israelis do in Gaza? Was it a sea or air based cruise? (It turns out, according to recent information it was launched from a US naval vessel). Although the usual pretext was put forth of `countering the Al Qaeda threat’, I wondered about the more salient reasons for the US launching such an attack? What were the regional considerations? As the United States does not make a move militarily without some connection to long term strategic regional goals, I wondered how they fit in too? All that led to a series of blog entries on Yemen, a powerpoint presentation and several speaking engagements – one at the University of Denver where I teach, the second an hour long radio program on Boulder’s KGNU. Now, seven months after the attack Amnesty International (AI) released photos and a report specifically on the cruise missile attack. The photo’s showed the remains of a US-made Tomahawk missile and unexploded cluster bombs that were apparently used in the December 17, 2009 attack on the rural community of Al-Maajala in Yemen’s southern Abyan province. 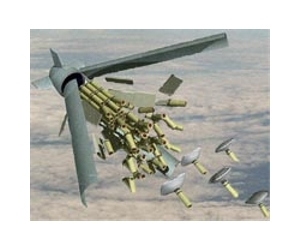 Cluster bombs are anti-personnel weapons whose main purpose is to do damage to civilian populations. They have been used extensively by Israel in Lebanon beginning in the late 1970s. More recently after the unsuccessful 2006 Israeli incursion into Lebanon which pitted the Israeli Defense Force (IDF) against Hezbollah, Israel dropped more than four million cluster bombs in S. Lebanon and this after a cease fire was agreed to. The United States has used them extensively in Afghanistan. The Israeli cluster bombs looked liked toys. Lebanese kids would pick them up and they would explode in their hands. 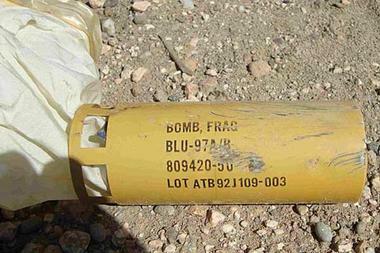 The cluster bombs the US used in Afghanistan often appeared to be food aid packages. The photos from Yemen that Amnesty released suggest what many have argued – that the United States was more intimately involved militarily in the recent Yemen war than the Obama Administration has admitted. The US cruise missile attack came at a time when both Saudi Arabia and the Yemeni government in Sanaa were taking a something of a beating in their war against Houthi rebels in Yemen’s north. The Saudis came to the aid of the weak Yemeni government and engaged in savage – but poorly reported in the US media – air and ground war against the Northern rebels that included Saudi use of US made phosphorus bombs and extensive bombing of civilian populations. At the same time the Saudis suffered significant losses from its ground offensive in which the Houthi rebels embarrassed the Saudi military, killing more than 100 and repeatedly ceasing Saudi border posts. As the ground fighting appeared to be going badly for both the Saudi and Yemeni troops, the Obama Administration launched its cruise missile attack, in part, it seems to boost Saudi-Yemeni (Sanaa government) spirits. At the time, the Pentagon claimed that most of the victims of the Yemen attack were Al Qaeda operatives – or `terrorists’ – who, according to the United States lose all human and political rights and are fair game for assassination – even if this is a flagrant violation of international law and patently immoral. But a Yemeni parliamentary committee endorsed local Yemeni sources who gave a different story: that of the 55 people who were killed, most were civilians. Among them were 23 children and 17 women. “Collateral damage’ it’s called by US military sources. To date, Yemeni government authorities have been able to identify only 1 Al Qaeda operative (although they claim that 14 were killed in the incident). It resembles the high number of civilian casualties in Afghanistan and Pakistan from drone attacks and will probably have similar results: rather than weakening Al Qaeda in Yemen, such an attack evokes sympathy for the victims, inflaming anti-American sentiment there. A classic case of overkill, but since the victims were Arabs, no one seems to mind. In a statement released on the bombing, Amnesty noted” “Amnesty International is gravely concerned by evidence that cluster munitions appear to have been used in Yemen,” said Mike Lewis, the group’s arms control researcher. 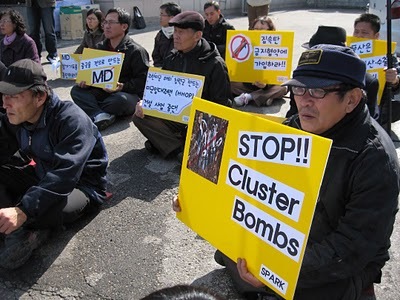 “Cluster munitions have indiscriminate effects and unexploded bomblets threaten lives and livelihoods for years afterwards,” he said. Typically the Pentagon played mum on the subject referring questions on the bombing to the Yemeni government. Fearing a strong anti-American response from its own people, Yemen’s defence ministry had claimed responsibility for the attack without mentioning a US role, saying between 24 and 30 militants had been killed at an alleged Al-Qaeda training camp. But a local official said 49 civilians, among them 23 children and 17 women, were killed “indiscriminately.” AI said a Yemeni parliamentary committee reported in February that in addition to 14 alleged Al-Qaeda militants, 41 local residents, including 14 women and 21 children, were killed in the attack. “The fact that so many of the victims were actually women and children indicates that the attack was in fact grossly irresponsible, particularly given the likely use of cluster munitions,” Luther said. AI said photographs it had obtained showed damaged remains of the BGM-109D Tomahawk land-attack cruise missile. “This type of missile, launched from a warship or submarine, is designed to carry a payload of 166 cluster sub-munitions (bomblets) which each explode into over 200 sharp steel fragments that can cause injuries up to 150 metres (about 500 feet) away,” an AI statement said. “An incendiary material inside the bomblet also spreads fragments of burning zirconium designed to set fire to nearby flammable objects,” it said. AI said photographs it had obtained showed damaged remains of the BGM-109D Tomahawk land-attack cruise missile. “This type of missile, launched from a warship or submarine, is designed to carry a payload of 166 cluster sub-munitions (bomblets) which each explode into over 200 sharp steel fragments that can cause injuries up to 150 metres (about 500 feet) away,” an AI statement said. “An incendiary material inside the bomblet also spreads fragments of burning zirconium designed to set fire to nearby flammable objects,” it said. The Yemen parliamentary committee had said when it visited the site that “all the homes and their contents were burnt and all that was left were traces of furniture,” AI said. AI said it had requested information about the attack from the Pentagon, but had not yet received a response. Amnesty said it had obtained the photographs from its own sources, but had not released them earlier in order to ascertain their authenticity and give the United States time to respond. The United States and Yemen have not yet signed the Convention on Cluster Munitions, a treaty designed to comprehensively ban such weapons which is due to enter into force on 1 August, 2010.